This is based on a Sri Lankan milk rice that I tasted in Galle a few years ago. It is not unlike Nasi Uduk (page 78) except for the obvious difference of the grain and the fact that it is set to cool in a dish and served cut into diamonds. Red rice is wonderfully nutty and chewy and the addition of coconut milk adds a lovely creamy touch. Like brown rice, red rice is brimming with goodness and is perfect to serve to your vegetarian friends. This is especially delicious with soupy stews and creamy curries. to the boil and cook uncovered for around 40 minutes, or until the rice is soft and most of the water is absorbed or evaporated. 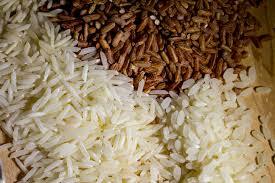 Add more water if the rice dries out before it is cooked. Add the coconut milk and salt to taste and bring the rice to the boil again. Simmer for 5 minutes. Remove from the heat and tip the rice into a square dish, pressing it into the corners. Cover with a layer of plastic wrap and place a weight on top. Set the rice aside for 1 hour. This is a simple alternative to serving plain steamed rice. The idea is that the sweet potato provides interest to the rice but doesn’t completely steal the show. To older Balinese folk, nasi sela actually indicates tough times as sweet potato has always been used to stretch out precious rice when it has been either too expensive or hard to get hold of. But even so, many people have a certain fondness for the dish, and we often serve it in our household. 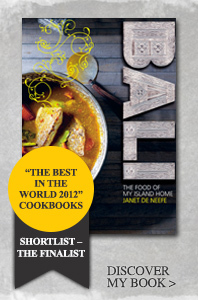 It’s especially popular with Fresh Sambal (page 22) for a simple meal. Peel and chop the sweet potato into small pieces roughly twice the size of the raw grains of rice. Put in a bowl and cover with water to prevent browning. Alternatively, put the rice and salam leaves in a large heavy-based saucepan. Rest a finger on top of the rice and add fresh water to just over the first joint of your finger. Bring to the boil. Cook uncovered for 3 minutes, then strain the sweet potato and stir it into the boiling rice. Cook for another 2 minutes, or until only a little water remains and the surface of the rice is covered with tiny holes. Cover the rice with a tight-fitting lid and lower the heat to the barest minimum. Cook without removing the lid for another 15 minutes. Turn off the heat and leave for 5 minutes before serving. it to the rice when the rice is just cooked. Hailing from Java, nasi uduk is an aromatic and luscious rice that is normally dished up with your choice of fried chicken, liver, tempeh or tofu, and a modest serve of peanut sauce. I first tasted it several years ago at a warung (food stall) aptly named Nasi Uduk on Jalan Teuku Umar in Denpasar – which is fast becoming a culinary goldmine for sampling the glory of Indonesian food from Manado to Sumatra. My first mouthful was a euphoric experience to say the least. I was intrigued and enraptured all at once and ploughed through about four serves of the rice in one sitting. It was served in small triangular banana-leaf parcels, adding to the perfection. Sadly, the increased cost of banana leaves has seen an end to this beautiful presentation, but the flavour of the rice is still just as glorious. Put all the ingredients in a wide heavy-based saucepan. Stir thoroughly and set aside for 20 minutes. until the liquid is fully absorbed and the rice is cooked. Don’t venture far near the end of the cooking time as you want to keep an eye on the rice and make sure it doesn’t catch on the bottom. Remove from the heat and set aside until ready to eat. Alternatively, you can put all the ingredients in a rice cooker.